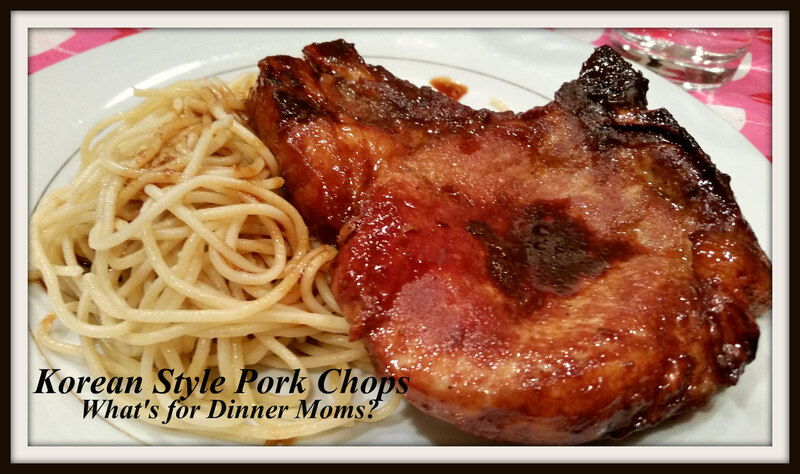 Korean Style Pork Chops – What's for Dinner Moms? Pork chops were on sale before Christmas so I am looking for different ways so serve them so my family does not get tired of them. We are nearing the bottom of the freezer for “No Buy January.” The pork chops are similar in style to the Glazed Pork Chops (click for link to recipe) that I made recently. But, they had a very different flavor. The Glaze Pork Chops were spicy there are more savory. Everyone loved this dish. This was even better than the Glazed Pork Chops for our tastes. It had a nice Asian flavor to the dish. This is a triple sauce recipe (my family loves sauce over everything). There should be enough extra to put the sauce over the pork, rice or noodles. If you do not like much sauce I would suggest halving the sauce part of the recipe. We served this with green beans and a green side salad. Place pork chops in a Ziploc bag and add all ingredients for the sauce to the bag. Move bag around to coat chops. Refrigerate for at least 20 minutes. In an oven safe pan heat olive oil. Remove chops from sauce saving the sauce for use later. Add them to warmed pan. Cook 5 minutes until a nice browned coating appears. Turn chops over and add sauce to pan. Depending on the thickness of your chops they may be done. Check temperature. You want them at least 140 degrees. If they are not 140 degrees place pan in the oven for 10 minutes. Check temperature. Remove from oven when done. Serve over rice or pasta with sauce. Great recipe. I am sure you are glad you can go out and buy again! Yes! Tonight dinner will be interesting! Yes, give me the extra sauce please! They look so tasty! Thank you. We are a saucy family.